Ambulance depot near an emergency response centre, in Freetown, Sierra Leone. Ambulances and drivers have to be disinfected after each trip carrying suspected Ebola cases. Response workers battling the Ebola outbreak in West Africa will receive “hazard pay” for the first time in Sierra Leone using mobile money because “unless there is a certain element of incentives, or danger pay, it’s very difficult to attract and retain people,” the United Nations Development Programme (UNDP) announced today. The transition from direct cash to an electronic solution will help to improve overall efficiency, timeliness and security of payments for Ebola response workers, Mr. Mukerjee said. (UNMEER), UNDP provided technical assistance and brokered a harmonized mobile payment platform, according to a press release issued today. The current cycle of hazard payments is being made from December 15 to 19, and approximately 16,000 workers who are being paid by the Sierra Leonean National Ebola Response Centre, and 13,000 are targeted to receive their pay through mobile money. In addition to the cash transfer development in Sierra Leone, in Liberia, a hotline has been established and a target has been established to make all back payments by the end of the year. And in Guinea, UNDP and its partners are harmonizing payment scales across paying organizations and improving the quality of payroll lists. Also today, UNMEER reported that Liberia has begun treating Ebola patients with serum therapy, which is a form of treatment made from the blood of recovered survivors, and that an Australian-run, British-built medical centre for Ebola patients has opened in Sierra Leone near the capital, Freetown. UNMEER also said Liberia is scheduled now to hold delayed senatorial elections on December 20, based on its Supreme Court ruling the vote should go ahead despite the Ebola outbreak. In Geneva today, Christophe Boulierac, spokesperson for the UN Children’s Fund (UNICEF), who just returned from Ebola-affected countries in West Africa, underlined the specific challenges confronting the fight against the virus in Guinea. Guinea was the biggest and the most populated of the three Ebola-affected countries where neither a peacekeeping mission nor military contingents were present, unlike Liberia, the UNICEF spokesman noted, and it was a country with poor infrastructure and few partners and non-governmental organizations present. Several rapid response teams had been sent there to provide swift and flexible response wherever needed, he said, outlining the challenges in raising awareness that was being resisted in some communities as well as insecurity that complicated the work being carried out by Ebola response teams. 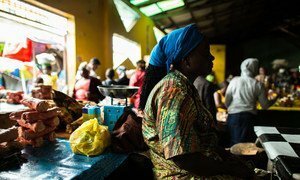 The United Nations Economic Commission for Africa (ECA) today recommended that creditors should seriously consider debt cancellation for the countries worst-hit by the Ebola epidemic in West Africa, and also projected that even if those most affected were to register zero economic growth, the impact on Africa as a continent would be minimal.